There is nothing wrong with modifying anything, just keep in mind without increasing the response of your private sector can create backlogs. well said. your post explains a lot actually and really helps for me. I play in a very odd style - I start with the hombase and I dont want other races living there at all and I dont want to colonize other style planets and races etc.. 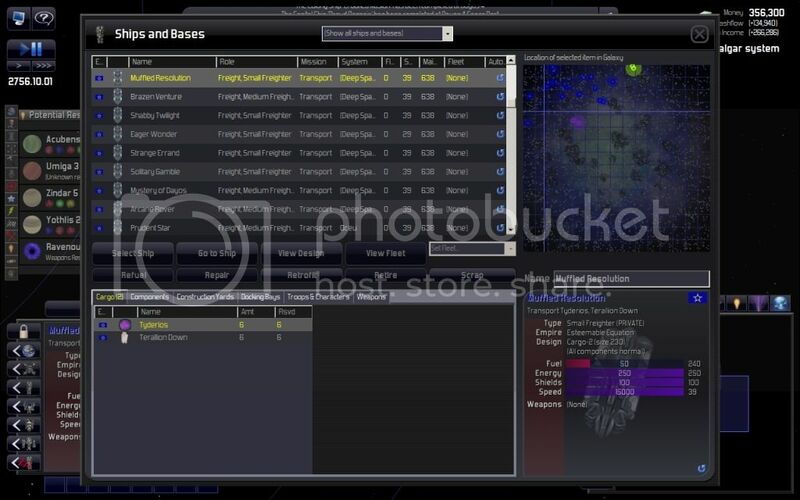 Check this out, my latest game i have like 6million bucks.. None other than 1 ... (yes 1) home human planet and am just not colonizing.. ha.. it works.. and the private sector is flying sky high in money as well.. (though i noticed with my own empire flag in the Cargo tabs : my "RSVD :is sometimes the same as "amount" and other empires flags with RSVD and Amount is the same (Amount:2000 Rsvd: 2000) *the other empire flag colors Im still not clear on why they are reserving and storing cargo in my base! ? dont worry ill bump up the difficulty settings soon enough.. right now every game i play i am slowly unchecking all the automation one by one and learning.. Status: offline stop ...... I put my foot in my mouth as they say! After getting in front of the game for 10 minutes I found that building a defensive base and adding features does not change what the AI thinks it is. It still is a defensive base according to the AI. Will not be recognized as a space port by the constructors, freighters or mining ships. It will be recognized as a refueling point and to build ships as it uses the planets inventory. Very sorry and deepest apologies. This can be reproduced by starting a new game ,scrapping the medium star-port and then building a modified defensive base at that colony. The constructor will not pick up supplies to perform a build. "RSVD :is sometimes the same as "amount"
that is because that empire(flag) has placed an order for that amount and that amount has been fully reserved. They are not storing cargo but picking up cargo or dropping off cargo. any rsvd amount will call out to the freighter network to fill that need as soon as possible. If you do not know where a source is the need will not be filled. If you come across a new luxury your race did not know about they will want it once they get a shipment. rsvd : what the freighter network has booked to be picked up. A good test for this is to start a game and as soon as you find the guardians spy to steal their territory map. When you have their map you will find that they hold some of the luxuries you need and your freighters will start running but your cash flow will suffer. Again, your freighters will haul from other empires unless they are overloaded. If after sorting you see that the amount on hand is lower than what has been rsvd at the colony or base then that empire's freighter is bringing in a shipment and you have paid for it. B)*Other empire flag : Ekarus Meat: Amt:138 Rsvd:138 - other empire is buying that from me..
A)*my empire flag : jakanta ivory : Amt: 422 Rsvd : 0 - I have 422 in stock.. but my colony doesnt need it and nobody has reserved it..
B)*other empire flag : jKanata ivory : Amt : 310 Rsvd : 310 - other empire has booked and coming to get 310..
B) **(made this one up cause couldnt find example)Other Empire : Steel - Amt : 100 Rsvd : 200 - I'm buying from another empire 200? man.. I really want to get this..
1: I think that is a strange situation, but. Another empire is coming 138. I find it strange that a colony producing a luxury (I am quite sure this is the case here) suddenly have a shortage. Did you swap the numbers? It could be that colonies reserve an amount for consumption, but that should not be in the thousands. Large reserves are usually incoming freighters. 2: Correct. You have some spare items sitting around that noone has "claimed". 3: A: 495 steel is short. It could be in bound on a freighter right now. Or the colony could be a steel source, and it will be produced soon enough. B: You would be short 100. That is exactly the same situation as in A. A "healthy" empire is not likely to import steel. It could happen if you for instance are in a clustered galaxy and have a remote colony near the colonies of other empires. But I don't think this happens as much after borders was introduced. Expecting a Galactic Financial Crisis any day now. The private sector needs to make money and hauling steel around constantly is not good for the bottom line. Luxuries have that and are a priority with new colonies. Now I have no idea if this is working as intended but it seems all wrong to me. These freighters are making a 8 sector round journey to pick up 16 and 12 resources. The following six freighters are only picking up Terralion (I suspect that marks the point where my Tyderios/Vodkol/Terralion mine opened up) and I can't see them getting any more. Either a) these freighters jumped all this way for a reservation of next to nothing, or b) they made a reservation for a larger amount which got stolen from under their noses. So, in my opinion of course, either the transport mission routine needs tweaking, or the reservations system needs tweaking. You can see they spent about 150 fuel to get there, and if they had it they would spend another 150 on the way back. p.s. The nightmare will continue for some time. At the time of the first screenshot I went through my freighters and 20 out of the 57 active (=fueled) are on transport Terralion orders. Some are going further to the Boskarans. I would really start to look for a nearby terralion source, but maybe they are hard to come by. How many luxuries are available from your sources? I don't know how those are prioritized, but do they struggle in getting the 10(?) they need? I have seen that as well. After a new luxury has been found and a mine set up or another empire is found to have that luxury, the freighter network will go all out to bring in supplies and yes it will run small shipments because of the limited extraction rate of that single source. I totally agree that the private sector should be tweaked to pick up only full orders and use that same freighter to distribute to the closest colony to cut down on 1/2 or 3/4 empty transports. I have also have seen a new mine reserve a luxury to a close empire and reduce the supply to my freighters. Whether this is WAD or not is speculation. They might of designed this to slow down expansion or this could be an over site. It is an inconvenience when freighters are forced into multiple runs to fill initial needs. Start a new game and manually order your constructors to build any mine but Casion and retire any Casion base and any gas mining ship. When you run into the ancient guardians, spy to find their home planet and discover their resources. Your freighters will start making runs. If any of those runs involve Casion retire that freighter. This will force a trade order because of the good terms you have with them and you can witness the transaction. This is the fastest way to see what is happening as they will have to trade with your medium star port. Status: offline You see that colony directly northwards of the cross, about 1/2 to 2/3 of the way to my homeworld? That system has a 50+% terralion source with a mine with double extractors. Some freighters are going there but more to other places (independent and Boskara). The colony out east, the one sort of in the middle, third from the right is also a terralion source, I forget the percent. No one is going there. All sorts of dumbness is going on when I've watched the freighters in this game. For example there are two Iridium sources within a sector of my homeworld. There were none at game start but basically they have been keeping pace, or even increasing the homeworld stores a bit. Back to 1500 was down to 1000 before the first source kicked in. Between them, when I looked about the time of these pictures, they had 2500 unreserved. But a freighter just decided to get Iridium from the Boskar homeworld. The mines have been operating for much longer than I have known about the Boskara, let alone where their homeworld is. Can't make any sense of that one, for example. I have been a bit tight on variety. Currently I have 11 luxuries plus 2 ultra-rares available. The ultra-rares are quite new only about 100 Loros and 650 Zentabia mined. You've heard a bit about the Zentabia... currently two freighters going there but their reservations were cleared a week or two after they were made. Sure they will still pick up, in fact if it remains at 2 it will work nicely since it is a decent trip but it worked like this - first freighter reserves 400 then a week later no reservations showing again... maybe two weeks later the second freighter reserves 450-500 but most of this is the same stock!... a couple of weeks later no reservations are showing apart from 10 for local population... all will be good this time since there may well be 800-900 by the time they get there and they will each get a good load but if a few more freighters had reserved in the following couple of months, well, maybe we would have something like in the pictures (assuming independent freighters or another empire cleaned out the terralion source before I got there). I've got a fleet on the way to conquer the independent giving the troublesome supply (bloody Naxxilians - never trust a dinosaur with a comlink ). They also have Jakanta which a lot of my colonies are demanding but no freighters are going to collect it. And I've a colony ship on the way to an Ekarus source which I don't have yet. Three luxuries (Caguar, Dantha, Bifurian) I have not yet found anywhere. There is one source of Yarras up on the northern edge of the map above my most eastern colony on a colonisable world. It's protected by pirates so I doubt that the Wekkarus will get it. But first I'm intent on snatching a 600+ million Wekkarus independent out from under their, um, err, noses? It's between the Yarras and that eastern colony. I found a good source of Nepyths somewhere but no one is demanding it and I have not had a constructor handy to develop it. There are a couple of low quality sources of Aquasian in out of the way troublesome locations. One of my miners is onto one but it's low down on my priorities. So that's the situation, not great but far from terrible. My constructors are all building fuel (surprise, surprise) and I've finally discovered a decent (i.e. greater than scientist bonus) location for weapons research. And if I get one free I'll be building steel before luxuries. I'm already swimming in money (built Bakuras and Rusan is 1/3 of the way at my homeworld) but finding the steel to load my constructors with is currently a massive problem. Status: offline Pipewrench, our posts crossed. Yes I see that too, but this is somewhat different, I think. Those are the first and second freighters of mine to go to that source. If they were further down the line, yes that is not that uncommon. But the first there usually gets at least 50 or 100 (and often 400ish if it is a new source). So I think the question remains - did they reserve that tiny amount and make the trip on that basis, or did they reserve more and not get it for some reason? Status: offline I always find it a problem to muster motivation to start a game. And figure out the settings. Maybe a game with only constructor control and watching freighters at work is where the real entertainment lies? Btw, in your images above, both were transporting not only terralion down, but also tyderios. You should not happen to have a tyderios shortage? That does not seem very likely, though. I think some old notes (legends notes, a patch?) mention higher priority to fuel mines. Maybe that is why your constructors are so busy? Status: offline Oh, I should add, that although my demand has blown way out for steel I still have something like 20k of it sitting in mines unreserved because all my freighters are... well see above. One of my more amusing games a while ago was played with me only controlling research and ship design (and the diplomacy you have to do). Gee the automation gets up to some shenanigans if you let it. It was funny to watch how even with much better designs the cpu could balls things up. A win was finally had but soooo much longer than it usually takes me. Was the Wiconium a major luxury resource that your race needs at the game start? The Nepyths, once a mine is put in place, will become a luxury wanted. The trade network just needs that commerce center to start the ball rolling. Always mine a brand new luxury if found, unless it is too far. I have found that most new colonies tie up freighters because they need their happiness raised as soon as possible. That is why the auto build for star ports is not enabled until the population rises and the luxuries can be established with some infrastructure put in place. If I build too many star ports at one time and colonize too fast a major backlog can seriously mess things up until constructors have had time to build more infrastructure. I totally agree that the Iridium makes no sense. The query must be confused unless the AI believes trade is more important to preserve current stocks?? Do you run a lot of automated navy ships? I generally don't use automated ships until a good way into the game. In early game my ships are in fleets, where they either. 4: Travelling back from fighting a target. I had the pleasure of watching a mine for ages (see tech forum). I noticed AI ships coming to patrol it (even a captured pirate capital, it values gas mines). They travelled a triangle with one point straight above the main. Going around in circles for ages. And what do the AI do with automated ships? Mostly patrols and escorts. Both which spend fuel doing it. My main activity is "sitting idle" which spends no fuel. Btw, I think that in my next game from scratch, I will run manual single ships, and park them at mines. I guess fleet postures won't work in single ships, which is a shame, because that "return to base" feature is sweet. Status: offline Pipewrench, most of those colonies have not had any luxuries delivered yet. Well, okay, some is more like it, perhaps an average of one luxury per colony. Given some more time though I think that what you say is what will happen. No on the Wiconium as racial bonus, I'm playing Kiadian (didn't realise how easy they were before) so the specials are Rephidium and Natarran. Three of them are lost colonies (2 pushing 4 billion already) and most of the rest 200-600 million from independents so the autopopulation triggers would cause this anyway even though I am not using them. If I build too many star ports at one time and colonize too fast a major backlog can seriously mess things up until constructors have had time to build more infrastructure. I'm certainly (deliberately) doing the first half colonising + conquering and 'building' (scarequotes because they are not actually building but just sitting the queues at 0%) as quick as possible. The infrastructure is not the limitation however but the transport. It will soon grind to a halt as the private sector orders ships which send me into reservations which will take a long long time to clear. Currently 80+ in the construction queue at the homeworld even though I have Bakuras there, and another 20 odd at my other spaceport. Adding construction yards won't help as the bottleneck is the supply of the strategic resources, which are needed to produce the freighters to carry the strategic resources. I figure that my colonies near my neighbours will get things built first from materials bought from my neighbours whereas my inner colonies will remain unbuilt for ages. So some of it I expect, but there is freighter madness going on beyond this. I think the algorithm is nowhere near robust enough since it does not appear to be able to cope. My constructors won't build me out of this because they will not be able to get materials, steel in particular, to build with since whenever it arrives at my two spaceports it will be turned into components for freighters. I might occasionally be able to sneak a little bit on board if I get the constructor to the dock quick enough that all the fresh steel has not been used by manufacture. Or I might be able to get a freighter supplying an unfinished job after many years except that I'm so unconfident of this happening in any realistic time frame that I will not even try. Mining Nephys would probably make my situation worse I think. One more thing prioritised ahead of transporting the strategic resources my empire really needs from the mines to the spaceport(s). Status: offline I wonder what decides who will get the next freighter (for a task). The issue with figuring out what freighters are up to is that you get to know the info late in the trip. The freighter will say in its order what it is transporting, but there is only room for a few items. You have to watch it vector to see where it is heading, won't know how much and exactly what is picked up until it leaves the pickup point, and won't know where it is to be delivered until the freighter has finished "aiming" into its hyperspace entry and the vector becomes visible. Up to some 30s freighters it could be possible to log all freight movements, and watch colony needs, but since you have to keep tracking a freighter to see its full order, it is not feasible. If you have 80 freighters in a construction backlog, it could be because you need those 80 to serve your needs. And instead they just assist in creating the current jam. Status: offline Bingeling, no not my navy. It's manual anyway but it only uses a small fraction of my fuel. Whatever military I have is constantly busy with pirates and monsters at this point in the game except for my minimal system defence forces which sit still guarding their targets and getting their energy from solar. But I don't have much - which is why they are so busy. And I usually refuel them straight from the mines. Its my freighters chewing through the fuel. Not just the flying around, although that doesn't help (300 fuel for 12 resources is not a good conversion rate is it?) but the fact that I am building new ones. And if I ever manage to catch up and get some in stock at my ports I'll go for enhanced storage and send myself dry again. Part of the reason is that it is an irregular map and hence very spread out (average of less than 7 systems per sector), and because I started on the edge it's all out and back. But although the settings are up the fuel intensive end of the spectrum it is also the silliness of the transports. 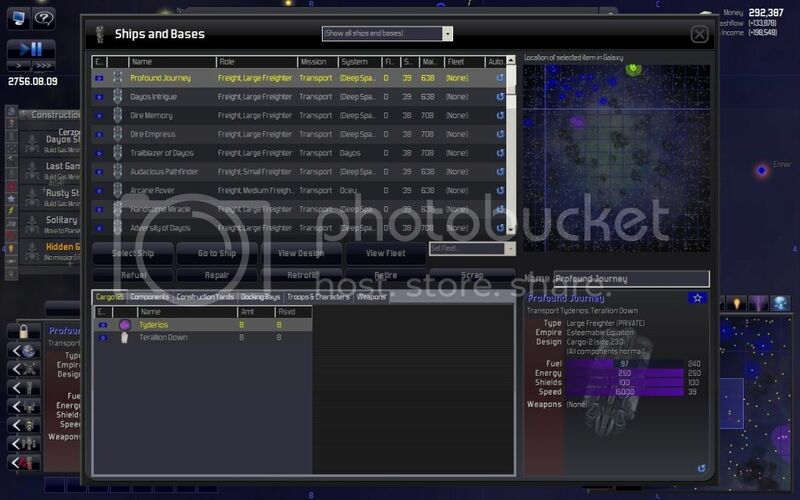 If my freighter makes a 10 sector round journey to the Boskars instead of the less than 2 sector round journey to my mine that's a lot of extra fuel, maybe 300-400 extra for the one freighter for the one load. A single journey like that doesn't matter much but when most of your freighters are doing that all of the time you need to keep building fuel. And where do they fill up? Predominantly at your spaceport. Wiconium not as racial bonus but needed when a colony is first settled. I believe every empire has ,because of base colony type, a certain set of base luxuries it desires. Any new luxury is a bonus that is on a lower priority. Wiconium may not of been on that original must have rsvd list at the beginning of the game. I hope that clears up what I was thinking and again this is specuguessing. Sorry also for hijacking the thread. Have fun fellotraveller and I hope the frustration just keeps you on a slow boil. Status: offline Ah, okay. That is an interesting suggestion. Wiconium was demanded from the very beginning... I think. But, and now your headache grows , Terraliion was not. I'm pretty sure it appeared later and is lower down on the list (in default order of appearance). Will check tomorrow just in case I have it wrong. I take all of this with a grain of salt. The freighters have definitely improved. I'm sure that it is hard to design a good algorithm for this. One way to make it better is to see how it breaks down in limit cases. In this case the limit seems to be doing too well. I guess what fundamentally bothers me is that it seems like the better you do in the game the worse the private sector copes. I would be surprised if it was working as designed though. It would mean that the game is 'cheating' on a fundamental level (refusing to supply you Terralion which would normally be there, or deliberately sending your freighters to the further source when they usually choose the closer), something it does not do elsewhere as far as I have seen. Don't worry I am having lots of fun. Status: offline Do you have an idea of what appeared first? If colonies (I assume it is them) decide it should have a resource and figures out the source early, it could give a situation where it prefers the far source (the one it knew back then) instead of closer sources. Status: offline I think there is a bit of that with the Terralion supply. The independent was discovered shortly before I finished my Terralion/Tyderios/Vodkol mine. It certainly makes sense for the first couple of freighters to go there given a simple algorithm which does not anticipate the completion of my mine and there are good reasons for keeping it simple. Fine. Even once my mine is operating I can handle the traffic being split between the two sources. But to be going to a source for so little when that source is at that distance does not sit well with me. The later mission to the Boskara, who were not discovered until much later than the above is also a worry, particularly since I have another source (colony) at much the same or slightly less distance which is not being accessed. Status: offline Okay Pipewrench I got it a bit wrong. Going back to the initial save both Terralion an Wiconium are demanded, but - and I'm not sure how significant this is - Terralion is the fifth demanded luxury, first one without any stock, and Wiconium is the eighth. By the time of the screenshots the sixth in the list has its demand satisfied and the demand for the seventh has disappeared a long time ago. Status: offline I designed a game back in 91-92 which had freighters moving cargo. Supplying the fuel and deciding what cargos to ship was a major headache. I expect that distant worlds 2 will have a new algorithm for the private sector, from lessons learned with the current one. The classic case is called the traveling salesman algorithm, expanded to a shipping network. 80 freighter spaceport queue? LOL, the worst I ever had was 400 freighters in queue at Bakuras shipyards homeworld, with a shortage of 40k steel and 15k aculon. But eventually they all got built and the homeworld shipyard was idle. From experience the less demanded resources get short, then ships arrive for a year carrying them even though the shortage is long gone. Want a tooth grinder? In my current game the homeworld has been short less than 2k of dilithium for over six months, and the queue backlog has grown from 60 to 140 ships. I have two dilithium mines about a sector and a half away with no reserved and several k of stock. The spaceport closest to them has over 5k in stock and about as much reserved as the homeworld needs. THAT is where I get it, from that spaceport not directly from the mines, which is AS DESIGNED. So instead of getting a roundtrip for a new freighter from my homeworld to a mine, it goes to the mine, then to the spaceport, unloads then undocks and another freighter docks, loads and comes to my homeworld, which takes a LONG time. Status: offline I have a past in optimizing search... And I have suggested a trade network between spaceports... Managing 50 colonies, 300 mines, scattered across space, with point to point transport of freighters is hard. I had around 500 freighters for some 50 colonies in my latest game. The empire was 7-8 sectors long along the ring of a circle galaxy, which is a bit special shape due to the galaxy type. Set up main trade hubs along a line. You want items to travel in your trade network. That empire would need 7-8 hubs max. Have 4 large freighters travel between each neighbor pair of hubs. That should be some 30 assigned. They should carry full loads. Give each colony two medium freighters to travel to and from the hub. Never light on loads. That is 100 medium freighters. Give each colony 4 small freighters to serve nearby mines. To bring full loads to the colony. That is 200 small ones. 200 medium, 200 small, 30 large. And there are still 70 to spare in the 500 current freighters of that empire. Of course, needs would have to propagate. A colony needs to know what is a shortage (pretty obvious), low level, suitable level, and excess. Or something along that line. When new colony A books its small spaceport, it asks the hub for the missing materials (and everything else it thinks it should need (luxuries). So the hub should know its real stock is lower, and keep track of "stock after subtractions". Which it could in part get from its own "sub colonies", or ask from the next hub. If asking the next hub, treat things the same, have needs propagate. Any freighter travelling a trip, should fill up according to what the destination needs, and what the current station got a surplus of. But in a game of this it is not necessary to optimize the freighters much, you can just balance the game around the inefficiencies, and avoid the worst stupidities. Like it is today, the freighters work, mostly. A fun effect of this would be feeling a need for bigger space ports at the hubs (more docking bays, faster cargo handling). Large amounts of freighters coming and going. And if the nasty human player comes and conquers a hub? Find a nearby colony to be the new hub, you just lost a rather big store, but there is enough stuff at the other hubs to boost this one quite fast (not to mention the colonies in the area). The hub should not be a giant store, just bigger than average, and where the goods flows through. Status: offline Yes, just getting my two cents worth about where I think the problems lie or at least start. Agreed, 80 is not much. In relative terms though I had more ships in the queue than on the map. And at that point there were still 120 ships the private sector would order once it had the cash. I've added three more colonies since the last ship building order, and have another 3 colony ships on the way and a couple of independent invasions lined up, although I think the real glut - beacons, found colony ships and lost colonies mainly - has passed. Still the private sector will be ordering another 200 ships for the colonies I already have as soon as it has the cash. Figure that's about a year and half's worth of private sector income, although it could well turn into merely a year with ultra-rares/Rusan kicking in. But the backlog has been growing - Bakuras with 12 yards - and the resources not being shipped. Status: offline I would guess it could be galaxy settings (too much goodies) and too much exploration early on. I don't see how the difficulty setting matters too much. You can also have hit a nasty random occurrence of "too early contact with foreign power with resources, and certain lack of other things". Things that makes your freighters go belly up. your food for thought is going to drive me to drink. If I have a hangover tomorrow it is because of you.. Totally agree and with the fruit does it go to the unhappiest colony first? I still have a hunch that freighters work on happiness. The faster you expand the more pressure is put on the freighter network to feed the new colonies with enough luxuries and basic resources to bring them up to a smile. As you grow some developed colonies fall behind not because of location but because they are happy and are not a priority. I am not near the game today but if someone has time move the colony governor to another planet and raise taxes to create unhappiness. If soon after freighters show up to fill the rsvd request it might help explain some things. Very good discussion people. Lets hope that the intelligence of the race is not a factor in the supply network as that would create pages of speculation. I still cannot come to any sane conclusion about small shipments unless crews are drinking or selling the product on-route or a large freighter is dispatched instead of a small freighter because of fuel considerations?